Our company is among one of the most sought after companies indulged in the field of manufacturing and supplying supreme quality Adult Dungarees in market. 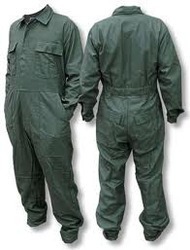 There is an extensive demand for these adult dungarees in market by our esteemed customers. These dungarees have smooth finish and are widely used by the adult generation. We use high quality fabrics and expertise to bring these unique masterpieces to our customers. At the end, these adult dungarees are available at customized prices in market. Dress yourself as per the latest trends prevailing in the market via clothing offered by us. Kalyani Garments, a company that is primarily engaged in the manufacturing and supplying of Readymade School Uniforms, Corporate Uniforms, Institutional & College Uniforms, Sports Wears, Punjabi Dresses, Cotton Sports T-Shirts, Track Shirts, Track Pants, Track Suits, Caps, Hats etc. In addition to it, we are also renowned as the most dependable suppliers of School Belts, School Ties and School Socks. We have also gained huge appreciation in the market as we provide immaculate Ladies Readymade Garments. Our company has also acquired inevitable position in the market among the top-notch Custom Hooded Sweatshirt Manufacturers in India. We have also provided flawless apparels to our customers so as to assure maximum satisfaction. We are also making diligent efforts to establish and maintain long lasting relationship with our customers. Last but not the least; we also provide the most advantageous and crystal clear deals to our esteemed clients.